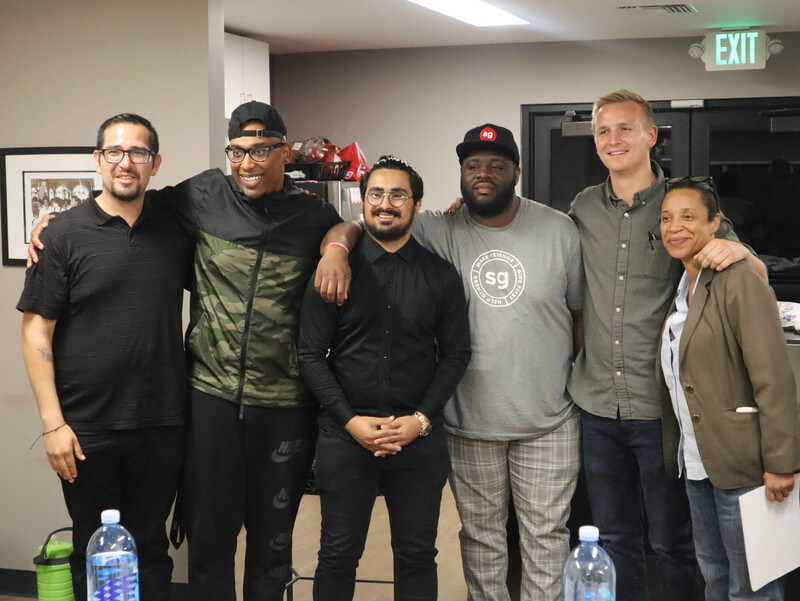 The next big idea was definitely on the mound at San Diego State’s Black Resource Center’s Pitch Contest on Thursday, April 11th. The evening event was the first of its kind in a new campus space dedicated to the well-being of students and staff from the African diaspora and beyond. The competition before the panel of judges was fierce! Contestants were given 3 minutes to pitch and were judged on communication, investment plan and their selection of a brand ambassador. Each participant took the challenge very seriously, gave concise and thorough explanations answering follow-up questions that showed off their preparedness. Most impressive was the high energy, laid back intellect and synergy around innovation both technological and sociological in the room. Pitch ideas were similar to the range of Wakanda-like iconography from the rhino shepherd to the high-tech science lab. We were pitched by a collective social entrepreneur artist community with a shared mindset of upending capitalism to a veteran/rapper’s digital ID. When all the pitches had been thrown, the judges: Cheryl Morrow, Editor-in-Chief of San Diego Monitor News, Doug Brantley of the SDSU Zip Launchpad and Luiz Martinez, Co-Director of Startup Grind San Diego had a very difficult decision. The Digital ID, secured third place runner up having a strong investment plan, he walked away with invaluable advice on re-prioritizing his distribution channels. The next Walt Disney’s virtual reality experience that will help improve lives took second place and walked away having decided on a specific business model. It was fabulous and fascinating watching the pieces fall into place for these proprietors that each won gift cards. Finally, our pitch with the homerun idea is an innovation of an outdated product dispenser whose upgrade has been sorely neglected. Not surprisingly, the product is for women’s reproductive health, and yet unexpectedly and most appreciatively has been re-envisioned by a young man from India. He pitched She Vend, a state-of-the-art vending dispenser for sanitary napkins, wipes and tampons to replace the often hard to find dilapidated white tin boxes that easily jam and offer no selection. Pranav explained that he was inspired to improve upon women’s access to clean menses related products by the widespread ostracization of menstruating women in the southeast Asian corridor including Nepal and Pakistan. In parts of India, traditional beliefs about the impurity of menstrual blood are taboo and women are shunned and isolated during this time. The She Vend pitch revealed Pranav’s idea is already functioning in the world with the support of the Prime Minister of India. He won the audience vote and the Judges vote, with a solid investment plan for marketing in the west and received helpful feedback on better brand ambassador representation. You can find out more about She Vend at http://www.shevend.com. The Pitch Contest winner received a $100 Amazon Card. Black Tech San Diego hit this one out of the park.